The Sri Lanka Security Providers Association (SLASSPA) has hailed the move by the Government whereby the salary/wage increase for all private sector employees will result in the basic salary of the security guards being raised by Rs. 2,500 per month. It will be dispersed in two instalments; Rs. 1,500 being effective immediately and Rs. 1,000 from 1 January 2016. 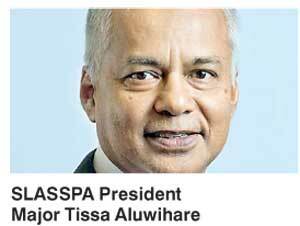 SLASSPA President Major Tissa Aluwihare said, “The Sri Lankan security industry has been suffering from the effects of a situation that is fast spiralling out of control. It is a vicious cycle where an increasing shortage of personnel, combined with low fees paid by clients, unilateral fee deductions and low salaries paid to security personnel, has resulted in an industry which is now lacking in morale and initiative. This vicious cycle has left its mark on our industry, with increasing deterioration of service performance on ground, resulting in losses impacting cost of production and competitiveness of key Sri Lankan Industries – such as tea, garments and cement”. Major Aluwihare went on to say that while during the past two decades the members and leaders of the Sri Lankan Security Industry, have endeavoured to find the ‘magic formula’ to put things right and create a happy balance between the industry, the clients and their workforce. “The vicious cycle of low salaries, low image, low recognition and low rewards have hitherto nullified their efforts. We, the industry, warmly welcome this increment, which would elevate our security guards, bringing their salaries close to the targeted threshold of earning Rs. 1000 a day, which is in-line with wages of gardeners and carpenters”. Major Aluwihare raised the question as to whether security guards who perform a valuable service deserve to be paid less than a gardener. “No, surely not! Hence it is our moral obligation to support this move to elevate their existence and give them a sustainable income commensurate with other Industries”. SLASSPA endorsed the fact that as a result of better wages paid to security personnel, clients across all industries would benefit from an improved, dedicated, performance on ground, reducing their cost on pilferages, while SLASSPA and other industry members would benefit from less staff turnover and less administration costs. “Our Security Officers in turn would benefit from a more sustainable income, less daily worries, higher self-respect and recognition,” said Aluwihare. “I would also like to state that our security personnel in the field perform a highly demanding job, often under very trying and rigorous conditions. As such, sadly they often remain one of the least recognised and hence marginalised professionals in society and in any corporate environment”. SLASSPA, in its capacity as a facilitator and nurturer of the industry, will do its utmost to support this Government proposal of increased wages for security personnel and will strive to encourage and coordinate the efforts of all security companies – SLASSPA members or otherwise, to seek a respective fee increment from their clients in the best interest of all stakeholders.